Discription: 49:00 mins, cardboard envelope. Inverz is a founding member of good luck mr gorsky (check out their split cd with eventless plot on granny records) and the eg.g collective. he has also collaborated and performed with freon, one mile tar, opora and a pleiad of underground musicians active in greece. 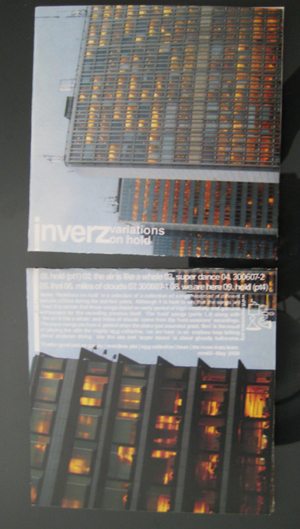 “variations on hold” is inverz’s first solo album and we were expecting it with real enthusiasm as what we already had listen to was very promising. but not as promising as it turn out to be. This is one of the most esoteric and atmospheric things that we have listen to for quite some time. structures emerge and dissolve as fast as melodies appear and disappear. loops of melodica follow guitar glitches and notes from an electric piano and all these merge in an organic body of sound soaked in feedback that u feel that will vanish in the background till the moment that something happens. always something happens and it is always hard to describe it in means of words. this is what sounds and music is for. this is what inverz is up to. If you thought all the Greek music scene had to offer was Demis Roussos, Vangelis or Nana Mouskouri, then think again. Hailing from Thessaloniki, Macedonia (that’s the Greek region, not the country lying to its north), Inverz have just released their first album “Variations on Hold” on the More Mars imprint, a label whose self-professed goal is to promote musical otherness, which entails never using capitals in album fact sheets (where we learn that the man has also founded good luck mr gorsky and the eg.g collective, as well as collaborated and performed with freon, one mile tar and opora to name but a few) and favouring deliciously left-field artistic concepts. And that is precisely what they have achieved in doing here. A collection of songs recorded over a period of two years, ‘Variations on hold’ starts off rather nicely with some deliciously dreamy guitar work set to a background of eerie synthscapes not too dissimilar from Johan Levin’s work on the latest Desiderii Marginis albums, and pretty much sets the mood for the rest of the album. Whether it be some distant reverbed guitar leading the proceedings or the monotonous repetitiveness of remote piano keys going on for longer than seems necessary at first, the songs never depart from a feeling of melancholy that is never ominous or dark but rather aerial and subdued, as if watching the rain out of a tram window on a cloudy Sunday morning. A near-perfect aural translation of some of the feelings one can experience walking around the empty streets of our megalopolises when all have gone to bed, this is urban music to the core, hardly a surprise from someone living in one of the largest cities in south-eastern Europe. At times intelligently minimalist (‘ihni’, ‘the air is like a whale’), giving the listener mental space to fill the gaps with his own experiences, at times striving for the grandiloquent (the superb ‘we are here’), here are nine songs that manage to strike a resounding chord. There are hints of some of Tor Lundvall’s work to be found and one or two songs could’ve been lifted straight off a Paula and Pablo Guarderas album but on the whole, the albums has enough gusto to stand on its own merits. Δε θα σταθώ σε ανώφελα βιογραφικά, είμαστε σε μία θέση που πρέπει να δεχτούμε τα πράγματα όπως πρόκειται να έρθουν. Περιττά σκαλίσματα δεν έχουν χώρο ανάμεσα μας. Η πρώτη σύνθεση μας προλογίζει μέσα από μία ξερή, σχεδόν ωμή κιθάρα, μαζί με μπερδεμένους ήχους που σιγά σιγά βγαίνουν μπροστά. Μη προσπαθήσετε να χαλαρώσετε, γκρίζα ambient ηχοτοπία γεμάτα με εξάρσεις πλήρης παραμόρφωσης, δεν είναι και το καλύτερο νανούρισμα. Τρίτη σύνθεση: και μετά η σιωπή, μέχρι να ξεπεταχτούν καινούργιες ράτσες, όπως θα έλεγαν και οι τρύπες! Δειλές πινελιές κιθάρας σε ένα ήρεμο αλλά υπερβολικά φορτισμένο περιβάλλον. Οι νέες ράτσες ξεπηδάνε σιγά σιγά. Έχουν κωδικούς στα μέτωπα τους, καμπουριάζουν, μα μπορούν και πετάνε! Η τέταρτη σύνθεση μας ξαφνιάζει με τις πινελιές πιάνου να έρχονται από το πουθενά. Το πιάνο παθαίνει κάποια αλλά κανένα πρόβλημα, όλα υπό έλεγχο! Ένας δίσκος που αν και κάπως στεγνός μας εκπλήσσει με την ανατρεπτικότητα του. Βαθειά ανάσα και συνεχίζουμε σε ένα εντελώς διαφορετικό πλάνο. Σχεδόν ιερά τριξίματα θα μας περάσουν μέσα από την πέμπτη σύνθεση. Το απρόοπτο που περιμέναμε να συναντήσουμε αργεί να έρθει. Παράσιτα βραχέων ντύνουν ξεκούρδιστα ακόρντα. Οι υψίσυχνες μελωδίες της έβδομης σύνθεσης δεν είναι αυτό που θα φαινόταν μία λογική εξέλιξη. Μα τι λέω, η λογική πέθανε εδώ και χρόνια. Η μελωδία σε υπνωτίζει, σου αρκεί αυτό. Ικανοποίησε ακόμη και με το αργόσυρτο ξέσπασμα της όγδοης σύνθεσης. Οξειδωμένα έγχορδα μας προετοιμάζουν για τον επίλογο ενός έργου σίγουρα μοναδικού, απρόοπτου και μοναχικού, όπως εξάλλου και κάθε το διαφορετικό γύρω μας.